Why Does Email with a Lot of BCC'ed Recipients Bounce? - Ask Leo! BCC is good for many things. Sending to many people at once isn't really one of them. BCC (Blind Carbon Copy), the ability to send an email to someone without their email address appearing in the header, is useful for many things. It’s a great way to make sure your boss is included on an email to someone else, without that someone else seeing that you’ve done so. It’s a great way to protect recipients from exposing their email addresses to one another, or to spammers — for example, when forwarding humor. Unfortunately, it’s also a great way to send spam. Sending the same email once to 50 recipients is a lot easier than sending 50 individual emails. Sending that email using BCC — including all 50 recipients on the BCC line, so they can’t see each others’ email addresses — seems like a polite and sensible thing to do. The problem is, spammers do this. As a result, long BCC lines, or the same message going to multiple BCC’ed recipients on the same destination service (say five of your 50 are all @hotmail.com email addresses), are a couple of the many factors considered when judging whether or not your email is likely to be spam. To me, 50 is excessive. I’m surprised your local email delivery succeeded without problems; I’d expect some of those recipients to have flagged your email as spam. It’s possible they did, but you didn’t hear about it, since all that happened was your email was placed in a spam folder without a bounce notification back to you. If I send you a message using BCC, you receive a message that is not addressed to you. I may put myself in the “To:” line, or I might put a different email address in the “To:” line. Naturally, the “From:” line contains my email address. But your email address is nowhere to be seen. That’s a mark against the message when it comes to evaluating spam. Now, it’s important to realize it’s not all-or-nothing. Using BCC doesn’t automatically mean your email will be treated as spam. It’s just one factor — perhaps even a small one — of hundreds used in aggregate to make a measured guess as to whether or not a message is spam. It’s going to “a lot” of email addresses all at once (as seen by the sending server). It may be going to “several” email addresses on the same domain all at once (as seen by the recipient domain’s mail server). It’s coming from another country (as seen by the recipient email server). It’s possible you were on the bubble, and that last point was enough to push you over for some number of your recipients. The right solution is to send 50 individual emails, each explicitly addressed “To:” one of your recipients. That’s a lot of work to do yourself. Fortunately, there’s software for that: mailing list software. This is the same kind of software I use to send my newsletter to nearly 60,000 readers each week. When my newsletter is sent, the service sends 60,000 individual emails. Each message stands on its own, each is explicitly sent “To:” one recipient, and no BCC is used at all. That’s my recommendation as the “right” solution: use a mailing list service for anything over 10 to 20 recipients that you plan to email regularly. The other alternative that might be worth considering, depending on your situation, is a Yahoo! or Google group. While this often exposes members to one another, these services are also set up to distribute email messages to large numbers of members. The email address you’re sending from matters. The email domain (the @hotmail.com part) matters the most. One characteristic of spam — and in turn a mark against you — is if email claims to be “From:” one address, but it’s being sent by mail servers completely unrelated to that address. For example, my email newsletter comes “From:” my email address @askleo.com, but it’s being sent by email servers @aweber.com. That’s a strike against me. If you’re sending from an email address on a free service, like yahoo.com, you don’t have the ability to make that kind of statement. Further, the owners of some domains — again, specifically, yahoo.com — can say “If you see email from a Yahoo.com email address that’s not coming from a yahoo.com server, treat it like spam.” What this means is that you can’t easily use mailing list services if you’re attempting to send “From:” a free email address. The solution here — again, if you plan to do this regularly and find you’re sending “from” a domain that has this issue, like yahoo.com — is to get your own domain. Just as I own “askleo.com”, you can own “yourveryowndomainname.com”. When you do so, the email services you use can help you permit them to send email on your behalf, and not have it seen as a strike against you. 1: Email, and particularly spam detection, has become incomprehensibly complex. What that means is that yet another of the hundreds of factors might include whether or not you’re using a free tier at a mailing list service. Paying money to send email, by using a paid provider or tier, implies more legitimacy, and can sometimes be a factor in your favor. It might be worth it to pay for it. 2: Specifically, the SPF record in the DNS entries for askleo.com includes this information. « Previous post: How Do I Hack Someone’s Account? Could you use c.c. which I think means “carbon copy’ instead? Before anybody else says it NO I’m not an email person but I do use c.c. when sending to my tax associates and they seem to get through. A lot of recipients in the CC or To fields could also cause a bounce. Most email providers simply limit the number of recipients they will allow you to send an email to. A small number of CCs or BCCs should get through. The number is different for every email service provider. Under 10 is usually allowed. by them as you are a paying customer. You can, but that then exposes the email addresses to everyone else that gets the message. If you include more than one recipient in the To: field in Thunderbird, it will offer to send it mail merged. A mail merge sends an individual message to each recipient. Thunderbird’s mail merge isn’t a true mail merge, as in a true mail merge, each recipient gets some personalized information in the message body. I don’t think this will solve the refusal to send issue from the senders’ email service providers, because it’s likely your email service provider will detect this, but it should help on the receivers’ end as each email is coming from one person to one other person with no BCCs. Outlook, the program, can send a true mail merged email, but still probably won’t fool your sending email provider as I believe they won’t send too many emails in one send operation. I’ve even seen cases where a freemail SMTP server will block sending too many emails in a short time. I use gmail, a free server that limits the number of addresses I can send an email to (around 15, I think). IMO, it’s a good idea for servers to limit the number of recipients to avoid spammers. Very few individuals who are not spammers need to send one email to 50 or more recipients. In addition, I can send multiple BCCs without putting anything in the “To” line, though I don’t think that means anything. You answered a lot about Bcc: and Spam. But I have a problem that my AntiSpam cannot help with. I receive e-mails stating sender as MY EXACT E-MAIL ADDRESS!! I cannot mark them as Spam or my real messages will be considered as Spam as well. This happens specifically on my hotmail account. Do you really have a solution TAHT WORKS for this situation, to filter out those e-mails coming to mr from an address claiing to be my own but it is actually not? I fear also that it may have been sent to others who may think I am the sender!! The funny thing is that they apperar in my Spam folder on hotmail.com, meaning that hotmail consdered them as spam, due to my having it “exclusive” i.e. allowing only addresses on my address book (list)!! Off topic tor this article. I just want to give Leo an FYI about two odd problems and don’t see another way to send the comments. (1) Firefox gave me a warning when I tried to reach the Krebs website. The problem disappeared when I changed Firefox from 32-bit to 64-bit. (2) My Windows 7 Pro firewall kept turning off. The problem disappeared when I uninstalled 7-Zip. I don’t think Leo or others directly addressed the issue raised by the original question, which was about emails being bounced – that is, receiving an “undeliverable” message. This is not the same as a spam. If a server along the transmission route flags an email as spam, it will kill the email and won’t report back to the sender with an explanation. An undeliverable email report is typically generated by your outgoing mail server or the mail server at the recipient end. But there is no law that says that these servers must generate an undeliverable report if they encounter problems, so sometimes the email can be dropped without a report back to the sender. Sometimes the undeliverable report indicates a temporary condition and the mail servers will continue to try retransmission until they succeed or timeout. But if they succeed, you’ll never know, as there is typically no subsequent report saying the transmission was finally successful. With 50 emails, there is a chance that some may be temporarily bounced. Let’s look at the transmission path: If the sender’s ISP stops the email as spam based on content, then it will stop all of them since they all have the same content. So, the content is not the likely problem and perhaps it’s the receiver’s address at issue. A particular receiver’s address might be stopped because of its domain, typically known to be a spam generator or otherwise blacklisted, such as because it’s from a certain country. The original question says that all recipient email addresses were in one country (US) which was different from the sender’s country, but only some of the email recipients were undeliverable. This suggests that the blocking was at the end of some recipients, but not others. An email can be undeliverable if the address is no longer valid, the ISP IP address is invalid, or the email storage limit or some other limit is exceeded. For example, see this page for gmail limits https://support.google.com/a/answer/166852?hl=en. Also, some email exchanges can be set not to accept emails from free email domains, such as yahoo.com. Again, typically if the receiver’s ISP considers email as spam based on content, it won’t report it back as undeliverable. 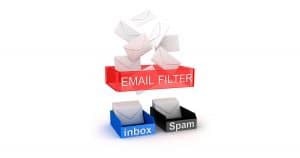 But there is a relationship to spam: If the sender’s email address or the receiver’s email address has been compromised by spammers, such that they are used as the “From” address of millions of spam emails, then they would have been blacklisted and blocked, generating an undeliverable message. To further diagnose this look for patterns: Did you actually mistype the email addresses that got bounced back? Are all undelivered emails in the same domain? Were they all in the same part of the country? Where the domain free email addresses, or conversely not? For the record, there absolutely are situations where email flagged as spam gets bounced. I see it often on some mailing lists that I administer.